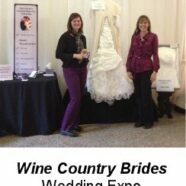 Home » General » Wine Country Bride Wedding Expo Was a Blast! 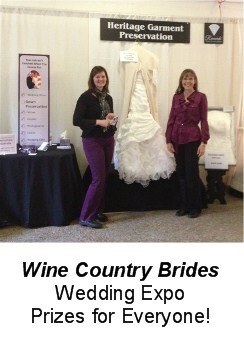 Wine Country Bride Wedding Expo Was a Blast! Jennifer and I spent Saturday talking to brides (and their moms, fiances & best friends!) at the Wedding Expo in Santa Rosa, California. I think between the two of us we spoke with about 300 brides! Busy day. Sooo fun! The Expo is a very well run bridal show – with fabulous attendance. Everyone was very excited to be there as well. We gave away a Free Wedding Gown Cleaning and Preservation at 4 o’clock. Every bride that signed up for our Free Reminder Service was entered in our drawing. Elise Douglas was our winner. Lucky Elise – her wedding is just a couple of months away. Saturday Show – we could go to church on Sunday…yeah! Hourly drawing for a free wedding dress! We gave some tickets to a friend whose daughter is engaged and she and her daughter attended and won one of the wedding dresses! So awesome. Their next show is September 22, which is on a Sunday (darn) but will be just as fun and informational for everyone who attends. After much research and even more hesitation, I boxed up my wedding gown and shipped it off to Heritage Garment Preservation. .. I just received my dress back in the mail a few days ago. Lovely, just lovely. My dress looks amazing. Believe me when I say you should put your trust in this company, they know what they're doing when it comes to your most prized (garment) possession.